One of my favorite easy salads with the best Avocado-Herb-Pistachio Dressing! Salad and pizza is one of our go to weekday dinners…. some of us end up eating more salad and some more pizza but everyone is happy, and it is quick! 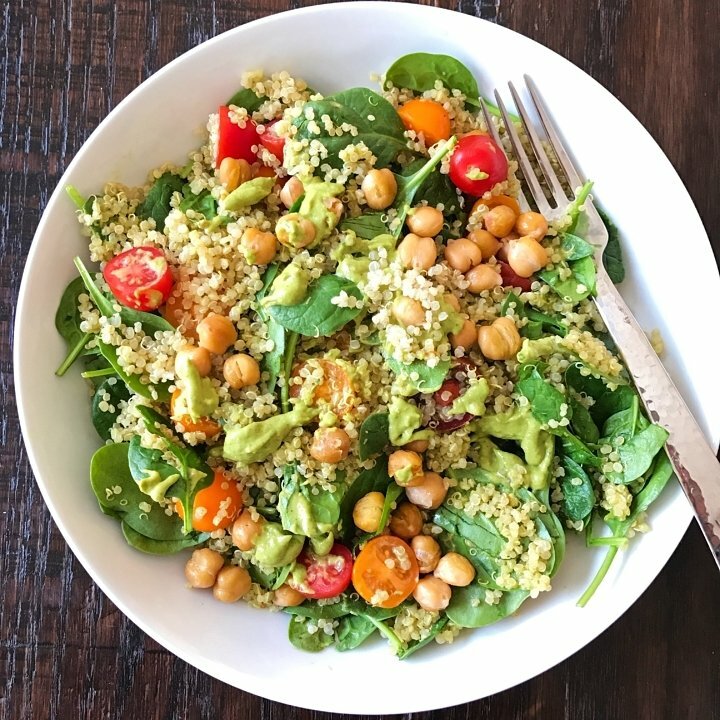 This Green Goddess Quinoa Salad, recipe from Pinch of Yum, is one of my favorites! Spinach, Quinoa, Cherry Tomatoes and a 5 minute Magic Green Sauce. It takes mere minutes to prep (we always have cooked quinoa at the ready in our house) and is so yummy. I actually think I may be addicted to the dressing–Avocado, parsley, cilantro, fresh lime juice, EVOO and pistachios… what’s not to love? Click here the recipe from Pinch of Yum.